The core circuits of quantum teleportation, which generate and detect quantum entanglement, have been successfully integrated into a photonic chip by an international team of scientists from the universities of Bristol, Tokyo, Southampton and NTT Device Technology Laboratories. These results pave the way to developing ultra-high-speed quantum computers and strengthening the security of communication. Qubits (quantum bits) are sensitive quantum versions of today's computer 0's and 1's (bits) and are the foundation of quantum computers. Photons are particles of light and they are a promising way to implement excellent qubits. One of the most important tasks is to successfully enable quantum teleportation, which transfers qubits from one photon to another. However, the conventional experimental implementation of quantum teleportation fills a laboratory and requires hundreds of optical instruments painstakingly aligned, a far cry from the scale and robustness of device required in a modern day computer or handheld device. 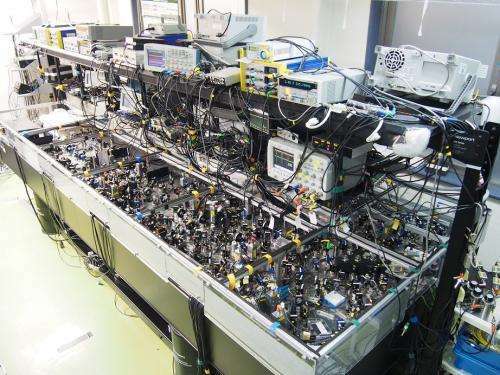 In 2013, Professor Furusawa and his colleagues succeeded in realising perfect quantum teleportation, however, this required a set-up covering several square metres; took many months to build, and reached the limit in terms of scalability. New research at the University of Bristol led by Professor Jeremy O'Brien has taken those optical circuits and implemented them on to a silicon microchip measuring just a few millimetres (0.0001 square metres) using state-of-the-art nano-fabrication methods. This is the first time quantum teleportation has been demonstrated on a silicon chip and the result has radically solved the problem of scalability. The team of researchers have taken a significant step closer towards their ultimate goal of integrating a quantum computer into a photonic chip. While there has been significant progress in current computing technology, its performance is now reaching the fundamental limit of classical physics. On the other hand, it has been predicted that principles of quantum mechanics will enable the development of ultra-secure quantum communication and ultra-powerful quantum computers, overcoming the limit of current technologies. One of the most important steps in achieving this is to establish technologies for quantum teleportation (transferring signals of quantum bits in photons from a sender to a receiver at a distance). The implementation of teleportation on to a micro-chip is an important building block unlocking the potential for practical quantum technologies. 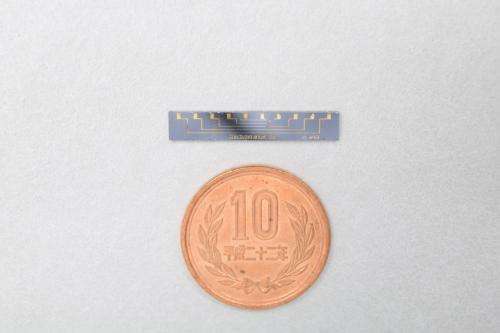 Professor Akira Furusawa from the University of Tokyo said: "This latest achievement enables us to perform the perfect quantum teleportation with a photonic chip. The next step is to integrate whole the system of quantum teleportation." 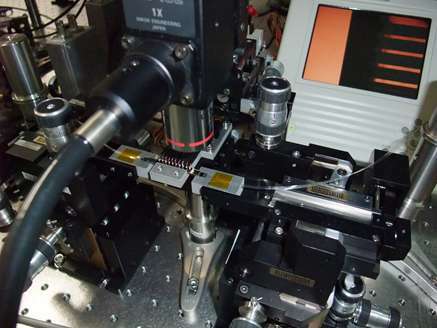 Professor Jeremy O'Brien, Director of the Centre for Quantum Photonics at the University of Bristol, who led the Bristol elements of the research, said: "Being able to replicate an optical circuit which would normally require a room sized optical table on a photonic chip is a hugely significant achievement. In effect, we have reduced a very complex quantum optical system by ten thousand in size." The research is published this week in Nature Photonics. @walter: the goal isn't superluminal information transfer, it's about computing and transferring information throughout quantum 'circuitry.' Teleporting allows you to move (but not copy) correlated state information from qubit to qubit in a unique way. There are going to be cases where classical computing in an optical or higher electromagnetic regime are still better than quantum computing. That's what your 'optical gates' are for, higher speed classical computing. But the two computational paradigms are complementary, not in opposition. "Teleportation" for Quantum Computing is solely based on "quantum entanglement," meaning, transfer of information instantly, at zero time, since measuring one entangled-particle (photon in this case) instantly affects the other. Besides the scalability challenge, the main challenge is producing sustainable entangled-particle couples, it is power-intensive due to the hundreds of thousands of iterations required. I'll be your assistant. I'm strong in marketing too. Lots of pretty toys. In order to read back the "teleported" information, you still have a light speed limitation. You might as well use optical gates. The idea is not to use this for information transmisson (which can't be superluminal) but for encryption (which can be since it does not constitute information transmission). Quantum encrypted messages are theoretically secure - which would be a feature that the world (and particular every private citizen) sorely needs. meaning, transfer of information instantly, at zero time, since measuring one entangled-particle (photon in this case) instantly affects the other. No. Information transmission is defined as the correlation between KNOWN a priori state and measured a posteriori state. In entanglement you cannot know the a priori state (you'd have to set/measure it - and that would break entanglement). This is quantum information transmission ("spooky action at a distance") which is something entirely different. The experimental setup of quantum teleportation performed in 2013 is pictured.